Clean Nordic furnished apartment in quiet location. More Sea-holiday! Welcome and thank you for your interest in our Fereinwohnung. The newly renovated apartment is located in a quiet location in Gelting and can accommodate 2 people plus possibly a child. It is located on the upper floor of a detached house and has a separate outside staircase. The living area is approximately 45 square meters and is in the hallway, bathroom with shower, separate toilet, kitchen, south-facing balcony split, living room and bedroom. The apartment is nicely furnished. We attach great importance to the fact that the apartment is rented in a very clean condition. Gelting is nestled between the Flensburg Fjord, Baltic Sea and the Schlei Fjord and is conveniently situated as a rural central place in the area Fishing an ideal starting point for your individual holiday. Reiter, cyclists, anglers, nature or beach lovers will find in the vicinity a wide range. In particular, the anglers we can provide advice and practical help. The nearby nature reserve 'Geltinger Birk' with its free-living wild horses and Highland cattle invites in a natural setting for hiking, cycling, Nordic walking. Bicycle tourists will find several signposted circular routes. 3 bikes, bike trailers for toddler bike trail map and bicycle holder (2) for towing hitch available to them free of charge. Also WLAN. Fishing, sea fishing trips, saltwater swimming pool, mini golf, Nordic walking, cycling, sailing, surfing, surf, tennis, walking, amusement park, boat trips on the Schlei. The apartment is especially suitable for anglers, as the landlord himself is an experienced sea angler. Guided tours for sea trout or flounder and cod possible. The nearby Gelting Bay offers some hot spots for sea trout. Specific months of March / April and October. Year-round surf fishing or herring in Kappeln. I am a Petri disciple myself. The Schlei offers eel, perch, whitefish. Fishing equipment can be borrowed from the owner for a small fee. From Falshöft to Hasselberg invite numerous natural beaches for swimming and relax. A dog beach is located in the region Pott hole. All beaches are tax-free. The beach section in the district Wackerballig on the inner fjord is particularly suitable for families with small children, because there is very low, the water level in a large area. The Geltinger Bay is also an ideal surfing and kite-spot. The 700-hectare nature reserve Geltinger Birk is a natural open pasture landscape in which reintroduced horses (Konik) and cattle live. The Birk is also refuge and breeding ground of numerous Wassservögel. Hiking and cycling trails run through the area. Starting points with ample parking, the mill Charlotte, as well as the location in Nieby, integrated station Geltinger Birk 'NABU. They also get detailed further information. The trail around the Geltinger Birk heard loud German hiking guide 'to the 10 most beautiful routes in Germany. A walk around the Birk you can also connect with a visit to the lighthouse Falshöft. This may be seen by the application and is particularly known as a registry office. In Maasholm was from a former army property the 'nature center Maasholm' created. There are numerous interactive offerings around the beach and sea. A village with a museum or a museum village. This sentence describes the location in Unewatt Landschaftsmuseum best. Should the weather not even be for the beach, but you do not need to give up their water fun. In Flensburg, Glücksburg, Damp and Eckernförde the year-round water parks offer varied bathing incl. Reichgefächertem spa. Sauna, infrared cabin and individual massages are offered in the resort. In Germany's northernmost amusement park Tolk-Schau 'you can experience at moderate prices a full day Familiennausflug and prepare their own food in one of the barbecue huts. 15 minutes behind Eckerförde lies, Tierpark Gettorf '. There, they can make direct contact with the animals in the numerous walk-in enclosures. experience the beauty of the Schlei The Schlei steamer Pricess. From May to September the place Schlei Princess and her sister ship Viking Princess twice daily trips in the inner loop from. A brief shore leave is included in most tours. The apartment is an ideal starting point for your fishing hobby. Tenants get a free fish-guiding. Especially in Spring and autumn is sher promising season for sea trout. As a landlord I start regularly and would love to show my clients the hotspots. Für uns 2 mit Hund war die Wohnung perfekt, weil sehr gepflegt, praktisch und gemütlich. Das Urlaubsnest in Gelting trägt diesen Namen zu Recht! Besser ausgestattet kann man sich eine Ferienwohnung nicht vorstellen. 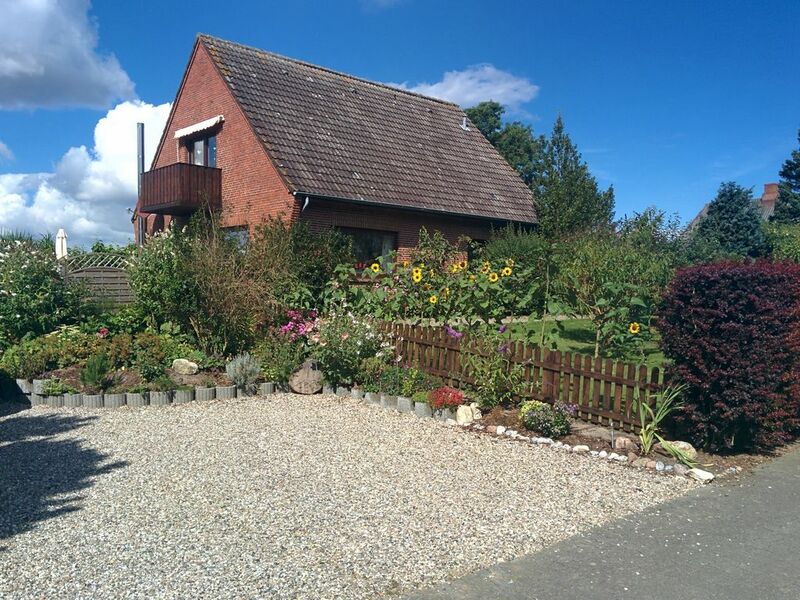 Vielen Dank an meine Vermieter für die freundliche Aufnahme - mein 2-wöchiger Urlaub war Entspannung pur durch eine liebevoll eingerichtete Wohnung und die ruhige Lage dieses Hauses in der wunderschönen Ostseelandschaft. Wirklich empfehlenswert! Ich durfte tolle Tage an Der Ostsee verbringen! Dabei habe ich die gemütliche und geschmackvoll eingerichtete überaus saubere Ferienwohnung genossen. Die Küche ist prima ausgestattet. Mit dem vorhandenen Fahrrad konnte ich die Gegend erkunden. Gelting und Umgebung hat einiges zu bieten und ist dabei nicht touristisch "überladen". Vielen Dank den netten Gastgebern! Kurz vor unsere Hochzeit haben wir uns entschlossen ein paar Tage Urlaub an der Ostsee zu machen. Zu diesem Zeitpunkt waren schon viele Ferienwohnungen belegt, was sich jedoch als puren Glücksfall für uns erwiesen hat. So ist unser Augenmerk auf diese Wunderschöne Wohnung gefallen und wir haben direkt die Vermieter kontaktiert. Zurück kam eine sehr herzliche Einladung, welche wir dankend angenommen haben. An unserem Anreise-Tag fanden wir die Wohnung in einem einwandfreien, sauberen und gepflegten Zustand vor. Egal ob WLAN, Flachbildfernseher, Grill, Fahrrad oder eine erstklassig ausgestattete Küche, alles war Vorhanden. Ebenso fanden wir einen kleinen Willkommensgruß vor, von dem auch unser Hund profitierte. Die FeWo ist ungefähr 1 km vom Ortskern entfernt, ein Besuch der lokalen Restaurants ist also auch fußläufig möglich. Alles in allem haben wir uns dort sehr aufgehoben gefühlt und freuen uns schon auf den nächsten Besuch. Gelting is located in the area Fishing at the output of the Flensburg Fjord and is an ideal starting point for many holiday activities. Reiter, cyclists, anglers, nature or beach lovers will find in the vicinity a wide range. In particular, the anglers we can provide advice and practical support. The nearby nature reserve 'Geltinger Birk' with its free-living wild horses and Highland cattle invites in untouched nature for walking / cycling / Nordic walking. Bicycle tourists will find several signposted roundabouts. Haustier (maximal Kniehöhe) erst nach Absprache möglich. Bitte nehmen Sie vor Buchung erst Kontakt mit dem Vermieter auf. Die An-/Abreise erfolgt in der Hauptsaison generell am Wochennede, vorzugsweise samstags.